Will Your Site Be Punished by Google's Friendly Mobile Update? You are here: Home / Marketing / Will Your Site Be Punished by Google’s Friendly Mobile Update? Will Your Site Be Punished by Google’s Friendly Mobile Update? If plenty of the big guys are in line to see a drop in traffic due to unfriendly mobile versions of their websites, the small businesses can expect to see repercussion as well. Google’s latest update puts more focus on mobile-friendly sites, including online stores. The update – aka “Mobilegeddon” – is planned for April 21, 2015, and the last time Google made this type of change, eBay lost a majority of its prime rankings on mobile search. So what’s in store? Google said this update is going to give mobile friendly sites higher rankings in search results. Mobile sites that sport large text, responsive designs, and clear calls to action will get bigger nods. That means – as I’ve said all along – that simpler is better when it comes to mobile. First, you need to test your site. 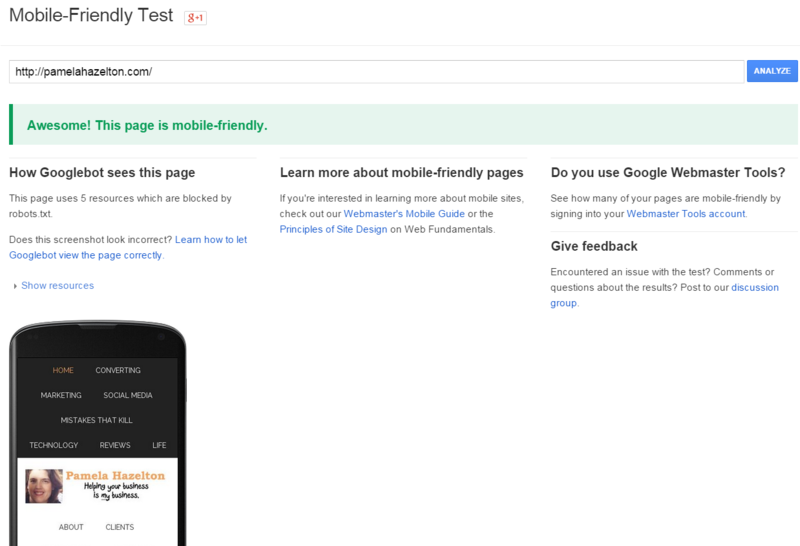 Head on over to Google’s Mobile-Friendly Test and enter your site’s URL. Googlebot will fetch the site and return the results within a few moments. Whew. I’m ahead of the game. Whoops. The Daily Mail may lose rank in mobile search. If you get a “Not mobile-friendly” result, heed the warnings. The tool will tell you the key reasons why the site stands to lose rankings. 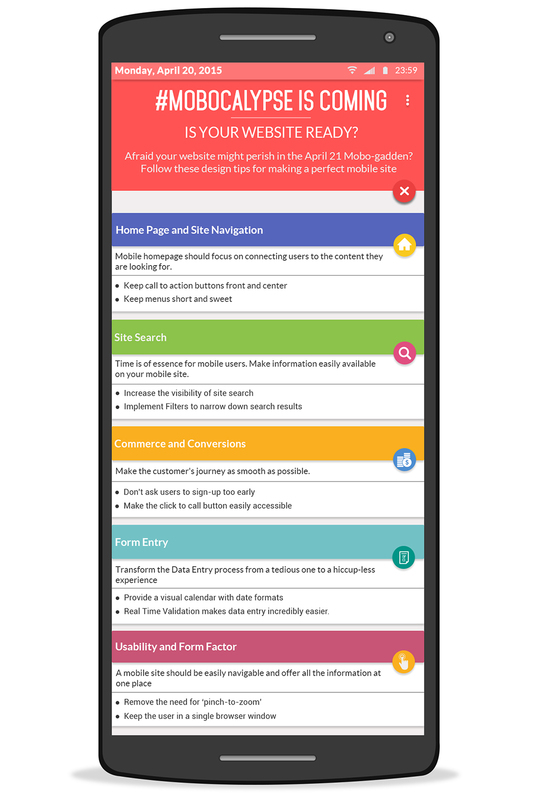 Some of the reasons may seem broad, but this infographic found at red website design explains what Google’s looking for in a mobile site. If your site uses a dedicated URL to mobile, you want to make sure that it loads properly. Unfortunately, that’s not always the case, so it’s a good idea to test the desktop URL as well. If you’ve published a mobile app for smartphones and tablets, that doesn’t protect you from Google’s update. Many believe this latest update will pack more of a punch than Google’s Panda and Penguin updates (if that’s the case, it’s more than huge – it’s ginormous!). Google reports that about half of online searches are run via mobile devices. There’s good news for small- and micro- business sites, though. This is a chance for the little guys to get more exposure while the rest scramble to implement changes. 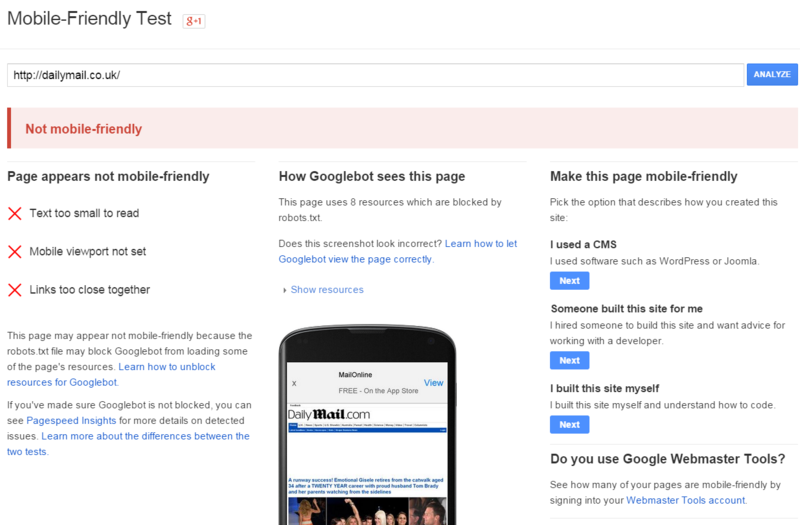 Does your site pass the test? Chime in below – I’d love to get an idea of who is ready for “Mobilegeddon”.